Agriculture faces enormous challenges over the next decades to maintain and increase crop production to match the demands of growing populations living under changing climates. Efforts are focused on identifying crop cultivars that are yield stable and stress tolerant. Find out how climate action could shape future vulnerability to food insecurity in your country by using a new interactive website produced by the Met Office UK / World Food programme. It allows readers to explore how different scenarios of global greenhouse gas emissions and adaptation to climate change could change the geography of food insecurity in developing and least-developed countries. The fertile crescent region is the geographic origin for grass families exploited in agriculture and crop production for over 10000 years. 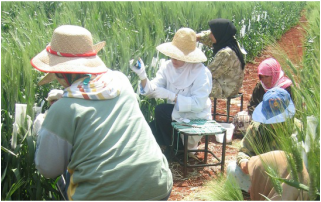 ICARDA's Genetic Resources Section (GRS) actively seeks seed collection, acquisition, ex situ conservation, regeneration, characterization and distribution of genetic resources of ICARDA’s mandate crops: barley, wheat, food legumes (lentil, chickpea and faba bean) and feed legumes (vetch and grass pea).